Hop into the gorgeous crescent-shaped pool in the warm Arizona sunshine. Test your skills on the challenging Gary Panks, 6,908-yard, par 71 course. With spacious dining room tables, no one has to eat on the couch. The gym is stocked with cardio and fitness equipment. It's home to the challenging par 71 Legacy Golf Course designed by Gary Panks. Lounge with your loved one by the gorgeous crescent-shaped pool. Indulge in a Swedish Massage or detoxifying body wrap. Hit a game or two on the resort's two tennis courts. Legacy Golf Resort is home to the challenging, eighteen-hole PGA tour Legacy Golf Course. Designed by Gary Panks, this 6,908-yard, par 71 course hosted the 2000 LPGA Standard Register PING tournament. The resort’s Spanish mission-style architecture complements the South Mountain Park right behind you. Take a dip in the outdoor pool or soak in one of the two hot tubs and keep an eye on the little ones splashing around in the children’s pool. Enjoy a refreshing drink at the poolside bar. Hungry? Take advantage of the bbq grills for a family cookout or dine at the on-site classic American restaurant. Engage in some healthy competition on tennis or sand volleyball courts. If you prefer a more traditional workout, there’s a well-equipped fitness center. Spacious studio, one- and two-bedroom condos are decorated with rich wood cabinetry and earth-toned fabrics. Studios sleep four guests and have kitchenettes, perfect for preparing basic meals. One- to two-bedroom condos sleep four to eight guests and have full kitchens. Pack light thanks to the in-suite washer/dryer. Flat screen TVs with premium cable and DVD players provide in-suite entertainment. Have the kids pack favorite movies from home, put one of the kids in charge of the remote and another in charge of snacks and gather everyone on the couch. All condos are air-conditioned, giving you a break from the Arizona heat. Old Town Scottsdale is the city’s historic downtown. Try the guacamole, prepared table-side at The Mission. The Artisan Markets offer unique souvenirs. Kierland Commons Mall features a variety of shopping and dining options. Pick up a new pair of jeans at Lucky. Grab a new pair of shades at Solstice Sunglasses. Check out the purses at Coach. Hungry? There’s Shake Shack, The Cheesecake Factory, and Mastro’s Ocean Club. Grab a latte or frappuccino at Starbucks. If you’re up for even more shopping, there’s Scottsdale Fashion Square. Little ones will love Build a Bear and the Disney Store. Treat yourself to a new handbag from Louis Vuitton, Kate Spade, or Michael Kors. For apparel, there’s H&M, J. Crew, and Tommy Bahama. Surprise the kids with a visit to Rocky Mountain Chocolate Factory or Cinnabon. Salt River Fields at Talking Stick is the Spring Training home of the Arizona Diamondbacks and the Colorado Rockies. Kids stay free! Up to 3 children under 18 years old stay free when using existing bedding. Rollaway/extra beds are available for USD 20.00 per night. The name on the credit card used to pay for incidentals must be the primary name on the guestroom reservation. 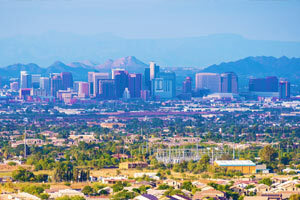 With 300 days of sunshine a year, Phoenix is one of the sunniest cities on Earth. It's filled with great dining, shopping, art, desert adventures, and is home to baseball's Spring Training.